Is This The Future of California Front Yards? The media is overflowing with drought doom articles. With an ongoing drought crisis a daily reality, is this the future of California lawns? I'm sure the neighbors love this...not. I have spent a lot of time over the years mowing and caring for lawns and now think they are a bad idea. This, however, is an ugly alternative. That's an understatement. This could be a front yard of beauty without grass. Terraced permeable paving with sub-irrigated planters (SIPs) would be an environmentally positive alternative. Living ground cover is unnecessary. I like brick but there is a wide variety of permeable paving options available these days. All permeable paving options would prevent run-off into the surrounding environment while the SIPs are saving water. There should be a taxpayer saving for those who install this type of landscaping. The SIPs could be a combination of composite wood planter boxes along with terracotta and resin in a variety of shapes and sizes. Most Americans, including landscapers, are unaware that all watertight planters or other types of containers are easily converted to SIPs. Sub-irrigation is a simple system not a planter product. Water-wasting drain holes are yesterday! There is no horticultural necessity for them with the use of SIPs. Why not also include some umbrella or arbor shaded neighborly seating? Plants should be both edible and decorative drought tolerant plants, including some SIP irrigated fruit trees. This front yard could be a neighborhood oasis instead of an eyesore. 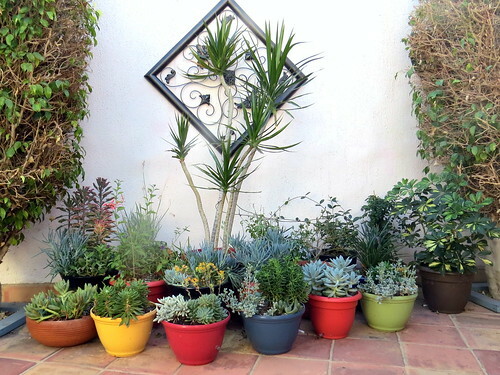 The entrance to the house next door is full of not very tidy water-wasting pots in the tie-dye style so popular in Southern California. Drought? What, me worry? Bong! This is a water-conserving test garden I installed at a bed and breakfast property nearby. It is six months old in this photo. The garden was installed in August last year not long after arriving in San Diego in May. Click to view the full album on Flickr. It was bloody hot and a tough chore to do it by myself. Given adequate time and more comfortable weather it would be a significantly more interesting design. I threw it together rather extemporaneously. I have been maintaining this garden monthly during the winter when the sun is low in the sky. 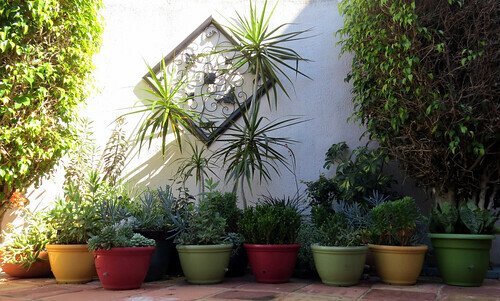 The spring sun has been slowly reaching the plants on the left. The plants on the right are shade tolerant. A two story structure to the right prevents full sun even in mid-summer. The planters are all from big box stores. All of them have concealed sub-irrigation plumbing. 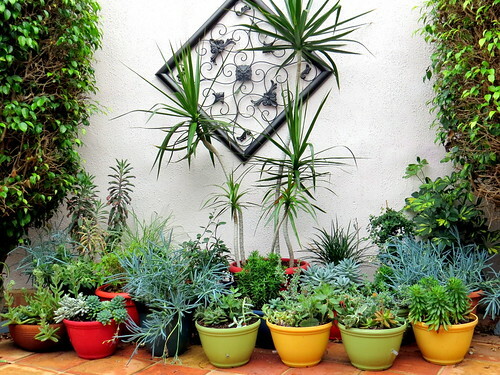 They are not special so-called "self-watering" planters. This would be an easy project in cooler weather. It is well within the DIY capability of most people. The two factors holding us back from widespread use of productive, water-saving SIPs is leadership and a lack of 21st century gardening education. Our politicians at all levels, even the White House, do not understand that our current horticultural education is attuned to our agrarian society from long ago. Dirt and drain holes were modern in the time of the ancient Egyptians. 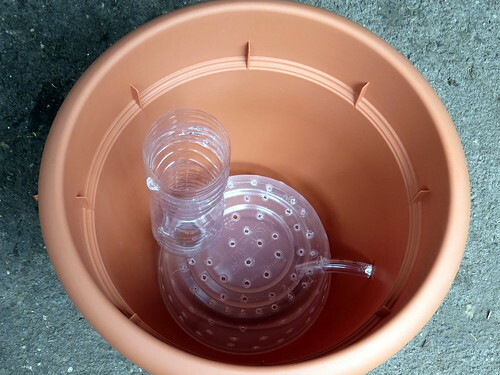 This is the very simple plumbing (picture below) used in all of the SIPs in the patio garden. The plumbing costs next to nothing. A fill tube is connected to the water and oxygen reservoir that is connected to the overflow drain valve. 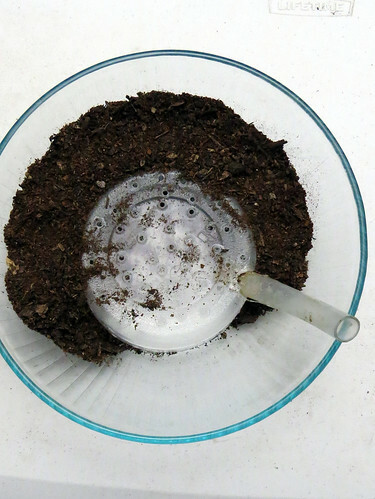 Light weight soil mix (peat/coir, bark, perlite types - no top soil or yard dirt!) tamped down around the reservoir acts as the capillary wicking. I call it a "bubble SIP". The plants are growing on a "cushion" of air and water. They love it! Larger planters such as planter boxes and raised beds would use the same basic elements arranged in different ways. See more about SIPs here. Watch a video by Elisa Bernick, former editor of Family Handyman, demonstrating a how-to about SIP planter boxes. Note the credit to this blog at the end. It seems like only yesterday that Frieda Lim and I made the first prototype of planters like this back in June, 2010. Unfortunately we did not videotape the event. The location was Liberty Sunset Garden Center in Red Hook, Brooklyn (no longer in business). It may have been the first sub-irrigated raised bed in the U.S. Thank you Elisa for making the video. You did a great job! I am most grateful for you having done it. Every Kid Deserves a Palm in a Pail SIP...Only $3! Click on the photo to see a larger version on Flickr. Click here to see the entire album titled Sub-irrigation » California "Bubble SIP" Drought Tolerant Patio Garden. The album contains an archive of photos taken since the garden was started in August of last year. Not a very good photo but it illustrates that the sun is slowly rising in the sky. The garden will not be in full sun even at the peak of summer but the left side will receive ample sun to create flowers. Plants on the right side are shade tolerant. I did no maintenance other than on the day of this photo. I added water to the large Dracaena marginata and a couple of other plants. That's it! All of the plants are in excellent health. It is obviously a water saving, low-maintenance, sustainable garden. This planter on the extreme left side shows the flowering benefit of sunshine. Other plants will bloom as the sun rises in the spring and summer sky. Note that the Ficus trees are putting out new leaves after the severe pruning last fall. They are growing in the ground as part of the property landscaping. 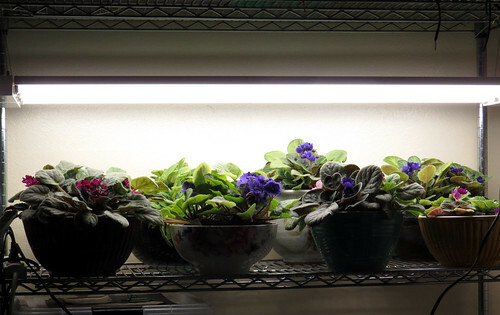 These African violets are growing under two 4' LED shop lights from Costco. They were recently on sale at Costco here in San Diego for $40 less $8. The adjustable light garden rack (4'x6'x1.5' on wheels) is also from Costco ($90). Note: Click on any photo to view the full album on Flickr and read more information that is pertinent to each photo. Click here to see the album. The sub-irrigated planters (SIPs) do not have drain holes. They have very simple sub-irrigation plumbing instead of drain holes. Drain hole "pots" are from antiquity. It's time to put them in a museum along side ancient Egyptian artifacts. Contrary to popular belief, they waste water, plants and time. SIPs save and promote sustainability. With the addition of very simple plumbing that provides both water and oxygen online, any watertight container can become a highly efficient SIP. 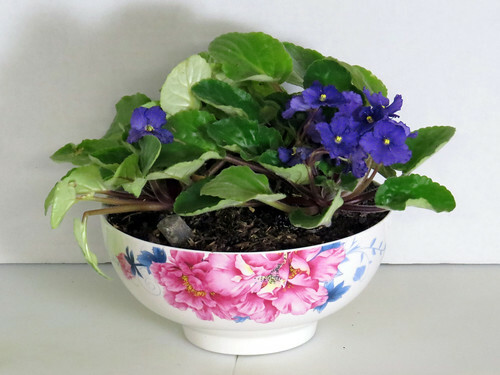 There is no need to buy special "self-watering" planters as erroneously termed in the U.S. The SIPs shown below are a melamine kitchen bowl, ceramic soup bowl and a hand-thrown ceramic bowl. There is no need to shop for drain hole "pots" in garden supply stores. Containers of far better design are available elsewhere in stores like Ikea, Costco, Target and other home stores. Asian supermarkets are good sources. Also browse second hand, thrift and antique stores for bargains. Melamine bowl from Costco (set of 4 for $20, bought on sale for $15). Ceramic bowl from 99 Ranch Market (Asian supermarket in San Diego). Hand thrown ceramic bowl from Spanish Village Art Center in Balboa Park. The photo below shows typical bubble SIP plumbing (below) in a clear glass bowl. Grow your first plants in clear glass. It is an excellent way to learn how plants grow in them because you can see the soil moisture and root system. Don't worry; the plant roots have no problem with light exposure contrary to popular belief. The key to SIP success is to only add water to the reservoir when the soil moisture calls for it...not because the reservoir is empty. The utterly stupid term "self-watering" has led to misuse of SIPs for years. Growers encourage the use of the term because they do not want your plants to live too long. Their business plans are based on consumption rather than sustainability. Don't be a sucker for that. Next up will be a post about bubble SIP containers from IKEA housewares. The possibilities are endless. To recap, this sub-irrigated patio garden is on a San Diego property that was recently a bed and breakfast. I stayed here when I arrived from Brooklyn last May. What a delightful B&B it was! With a very comfortable living room and kitchen, I would gladly have stayed for the long term. The owner has excellent taste in art, furniture and artifacts that he used to decorate the rooms. I will not forget the lush patio plants that thread through the property. There was also a rooftop dining deck. It is most unfortunate that the inn never fully recovered from the recession. The owner is now reluctantly converting the B&B rooms to apartments. I feel bad for him. The inn was a significant part of his lifes work. San Diego has lost a historical property that legions of people enjoyed over the years. On arrival in San Diego, I made an effort to donate my plant science lab to Balboa Park for use in children’s education. There is, after all a historical botanical building there that obviously needs professional help. Amateur gardening volunteers staff it. The park manager rejected the donation offer on the strength of an amateur gardener's advice. The email is a public document that I may reveal in a future post. San Diego taxpayers should know how their money is managed at Balboa Park. I believe it is a San Diego, State of California and National treasure. Make that a World treasure. I immensly enjoyed being in the company of tourists from all over the world this past holiday season. What festive days they were. Many photographs are coming soon. I have also observed that the park is becoming frayed at the seams thanks to budget cutbacks and the ever-increasing use of amateur gardening volunteers. I have coupled my daily walks with photographing what I observe along the way. I will soon donate this large collection of site-survey photos to the mayor’s office. My landscape architecture training has come in handy for this project. I believe a day of reckoning is coming in the not too distant future. Budget cutbacks coupled with the drought crisis have taken a heavy toll on the park plants, sub-tropical palms in particular. It is never a good time for this to happen, but this year it is particularly ill-timed. It is the Centennial year of the 1915 Panama - California Exposition in Balboa Park. Back to my plant science lab and the water conservation patio garden. Fortunately, the B&B owner provided a temporary shelter for my lab. I am forever indebted to him for doing so. As a small token of my gratitude, the patio garden will remain for the enjoyment of future apartment tenants. Thanks to sub-irrigation, the garden requires very little maintenance. 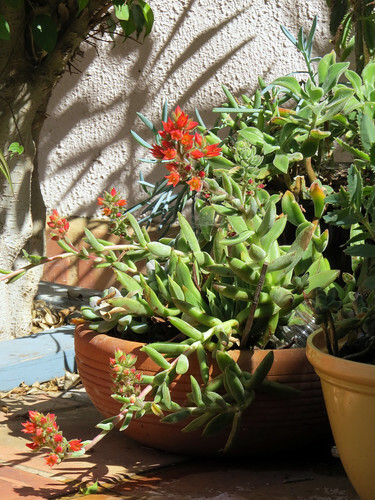 Future tenants can snip succulent cuttings and propagate them as houseplants if they like. I will gladly donate a supply of “bubble SIP” inserts of various sizes along with instructions. I installed the garden in the extreme heat of this past summer. I did it in a rather impromptu manner, considering the physical stress on my old bones in the heat. No problem, everything is movable for improved esthetics. On a redo, I would have used more Mexican terracotta planters. It took a while to solve the problem of needing to drill overflow drain holes in the side of these thick clay planters. A simple “trick” (hack?) solved the problem. There is now no need for drilling clay or ceramic planters with bottom drain holes. That is a devil of a job even with the right tools. The simple solution is an overflow pipe that goes from just below the top of the reservoir bubble down to the existing drain hole in the planter. The key step is to make the drain hole connection watertight. I used Goop clear adhesive. It is my all-purpose choice for plastic gluing. It is almost as versatile as masking tape. 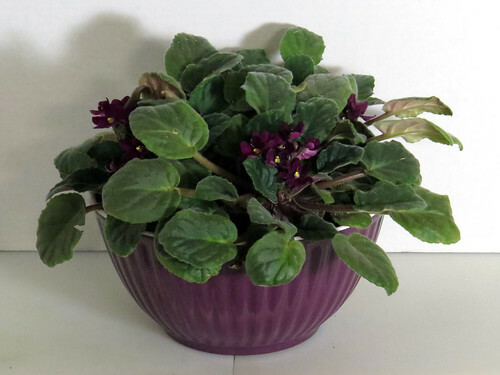 I can tell by Flickr stats that people are overlooking this terracotta and ceramic planter method. Note that I realized afterwards that the overflow drain does not have to pierce the bubble top. There is no need for a hole protected by a piece of screen material if you just cut it short under the bubble top. See larger photos here (5 in sequence). I will post corrected photos in the near future. It might help to think of this bubble SIP design as sort of a sink with the drain at the top of the sink rather than the bottom. When the water level reaches the top of the drain tube it will flow down the tube and out the bottom drain hole. Again, make sure the bottom connection is watertight or else the bubble will not hold water as a reservoir. In closing, note that there are a few more plants added to the garden. When the B&B closed in October, I moved some plants from the B&B utility room to my U-Haul locker. They were in the dark for a couple of weeks and then in the back of my SUV for some time. Older folks will remember John Cameron Swayze and his Timex commercials. “It takes a licking and keeps on ticking.” These plants have certainly done that...and will do so in the future. p.s. Please perform a public service by Tweeting, texting or emailing this post to friends and professional colleagues. We desparatly need the energy and technology experience of young people to grow a movement to counter the embedded, reactionary gardening establishment. It is time for them to retire, go fishing or travel the world. Obviously I do not have my social networking act together but plan to in the coming year. It is time for me to invite some young people and progressive, independant thinking older folks to join the band and march in this parade. What you have read here about reactionary gardening is just the tiny tip of a massive iceberg. I have more than enough researched and experiental information to write a book. It is long past time to blow up the iceberg. Associate Caroline, along with DIY blogger/gardening expert Whitney from The Curtis Casa, demonstrates how to plant a succulent container garden. They use a copper jelly pot, and fill it with succulents and cacti. Watch and see how they fare. 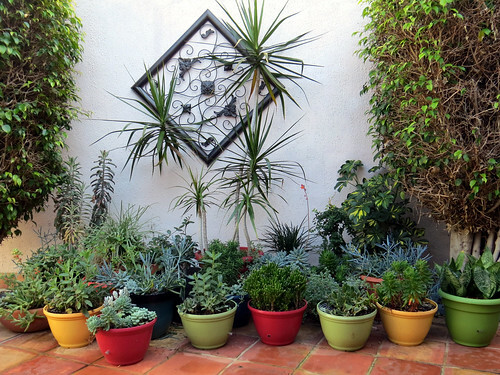 A potted succulent garden is something that can stay with you for years if properly cared for. 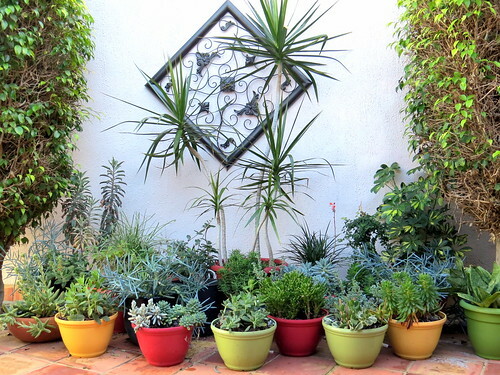 Find out how to create a potted succulent garden with help from a nursery owner and flower expert in this free video clip. Forget what you see and hear about planting a succulent garden in these videos. Instead, simply grow in "bubble SIPs" like this. All of these plants are growing in relatively low-cost planters from Home Depot and Lowe's equipped with very simple DIY sub-irrigation plumbing (see here, here and here). The growing media is a basic light-weight mix of peat moss, or coir, bark and perlite from a big box store. Read the label on the bag before buying. Special "cactus and succulent" mix is not necessary. Save yourself a lot of aggravation while saving precious time, plants and water. SIPs are a sustainable and environment-friendly way of growing plants. Try it, you'll like it...and you will help save the world! All drain holes do is waste water...and plants. 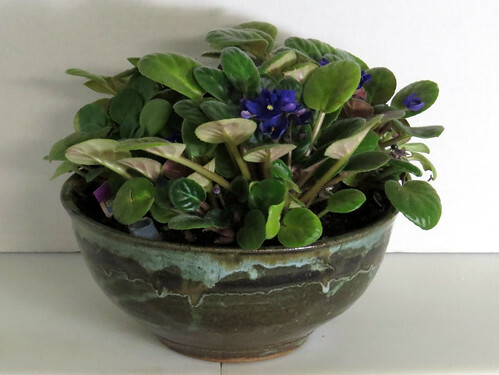 If you must live in a prior gardening century and grow plants in pots with drain holes read the following about putting pebbles, pottery shards or whatever in the bottom of the pot to improve drainage (as recommended in both videos). YouTube has some great information but it's a horticultural minefield. There are lots of amateur gardeners selling their own "home brew." Caveat emptor! Using crocks to help containers drain? A potty idea. It's a sacred principle of container gardening, but putting crocks at the bottom of a container can do more damage than good. Click on the photo to see a larger version on Flickr. Click here to see the entire album titled Sub-irrigation » California "Bubble SIP" Drought Tolerant Patio Garden. The album contains an archive of photos taken since the garden was started in August of this year. The sub-irrigated planter “bubble SIP” garden is now 4 months old. It is a testimony to the water conservation value of SIPs during a time of the worst drought in 1200 years of California history. It is difficult to understand why the entire University of California Extension Program (including their so-called “master gardener” program) completely ignores the use of SIPs. They seem to live in some prior agrarian time of dirt, clay pots and drain holes. It is a social disgrace to say the least. It seems this may be a bit too complicagted for the UC extension program and its master gardeners. Or, is there some other reason why they do not teach the public about the many benefits of sub-irrigation at the time of a severe drought crisis? I have a recent copy of the University of California Master Gardener Handbook. It contains nothing about sub-irrigation, even under the inappropriate term of “self-watering”. This water-saving SIP garden has had little or no maintenance during the past month. Since the property is being converted from a bed & breakfast to apartments things are unsettled. Back in October, when the B&B closed, I moved excess plants from their utility room into my U-Haul storage locker. The three plants from center to right (green, yellow, green) were resurrected from the locker and installed in the garden on 12/05/14, the day I took the garden photos. It is rather unbelievable what these plants went through. I had to do a bit of rehab but nothing major. It will be interesting to watch them grow now that they see daylight again. As you can see, the garden needs some pruning. The cuttings will not go to waste! This garden is easy to care for and easy to propagate. I did a site search on the USDA.gov website. The search string was "sub-irrigation" OR subirrigation. The following (see below) was the first hit of 284. Note the first sentence "half the amount of water." Note also the study was conducted in a container nursery (i.e. container garden). The key fact is that the plants were watered by sub-irrigation, just the way you can with DIY sub-irrigated planters (SIPs). See recent posts about "bubble SIPs" here and here, or see the bubble SIP archive. Know that bubble SIPs are scalable. For larger planters simply increase the size of the "bubble" (i.e. the water/oxygen reservoir). A chart for this is on my to-do list. Information of this type will definitely be in the book I am writing. This USDA information was not meant for your eyes as a gardener or consumer. It was meant to be read by growers (i.e. farmers). Now let's do the same site search on this website (it also "belongs" to the USDA via their extension program). It is meant to serve gardeners, consumers, educators, school children...and you. The same sub-irrigation site search produces 0 results! There is nothing on the "master gardener" site about water-conserving sub-irrigation at this critical time of a drought crisis. As a consumer, or gardener or taxpayer, how do you feel about this? Someone is not talking straight...at our expense! With about half the amount of water, subirrigated Metrosideros polymorpha Gaud. (Myrtaceae) grown 9 mo in a greenhouse were similar to those irrigated with an existing fixed overhead irrigation system; moss growth was about 3X greater in the fixed overhead system after 3 mo. Moss growth was affected by the rate of preplant controlled release fertilizer added (more fertilizer, less moss) and moss maturity, quantified as presence or absence of sporangia, was slowed with subirrigation. About 5 g nitrogen (N) leached per m2 (0.02 oz/ft2) of greenhouse bench under the fixed irrigation system, whereas none was lost from subirrigation. Besides Metrosideros macropus, the USDA Forest Service and Purdue University are evaluating subirrigation for nursery production of other species. To date, the results indicate subirrigation may be a useful technique for growing native plants with large canopies where conventional irrigation systems are less effective, or where water use or other environmental concerns are paramount. Dumroese RK, Pinto JR, Jacobs DF, Davis AS, Horiuchi B. 2006. Subirrigation reduces water use, nitrogen loss, and moss growth in a container nursery.